After being cooped up in the office all winter, you’re finally back to making tee times and travel plans and stretching so you don’t hurt yourself when you get out there. 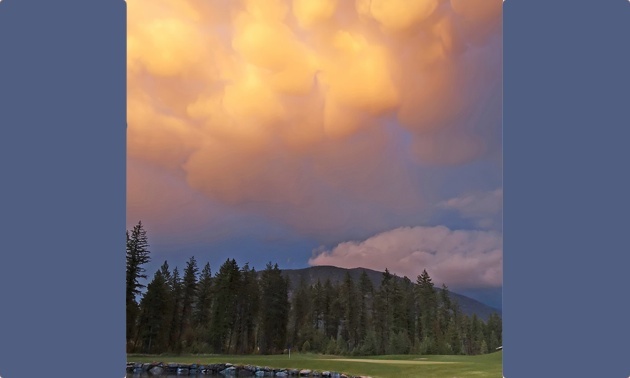 But sure enough, every time you book a tee time the clouds roll in. All is not lost, dear readers. We here at GolfWest have some things for you to consider before you call in and cancel, and a few tips for you to get the most out of your round in the rain. Put it this way: you want to play in the rain before you need to. If you’ve booked a trip to a prestigious course somewhere and it turns out to be raining, you’re not going to cancel your round—so you’ll want to have some practice time under those conditions, right? Rain can help my game? Yes, it’s annoying, but wet conditions can actually improve your score if you know how the moisture affects things. For starters, when it’s wet there’s less friction between your clubface and the ball. For those of you who have trouble with left or right spinning shots (hooks or slices), rainy days require less compensation for those spins and allow you to take a more direct line, according to John Swanson, director of golf at Shadow Mountain Golf Course in Cranbrook, B.C. Secondly, if you watch any golf on television at all, you’ll know they’re always talking about the “greens drying out” over the course of the day and how that changes the playing conditions, and you’ll have heard players say things like, “with all the rain recently, the greens are very receptive,” and “you can really fire at these pins,” when conditions are damp. Rain benefits the amateur golfer possibly even more than the professional, as not only are those shorter irons going to stop quicker once they land (meaning you don’t have to take roll-out into consideration as much on your approaches), but you’re also far more likely to hold the green with a shot from further away that comes in lower and faster. “Wet, sloppy conditions hinder the amount of roll you will receive when hitting the fairway and approaching greens,” Blair said, and that’s a fact you can exploit if you’re aware of it. Maybe you don’t have to land your 4-iron well short of the green and hope it gets through the longer stuff and up onto the putting surface, for example, if you know you can land it on the front and not have it run over the back. Also, once you’re on the green, that extra moisture means that your putt won’t roll as quickly, either. You can be more aggressive, take more direct lines (hitting through the break), and not worry about running further past the hole than you started (assuming you’re not a gorilla about it, of course). While it’s good for the course to soften up and the ball to have less spin than normal, it’s really an unpleasant experience to golf while you yourself are dripping wet. Of all these amazing products, Swanson and Blair both said that rain grip gloves are possibly the best investment. Aside from the obvious, like a waterproof jacket, make sure your spikes are in good condition if it’s going to be wet out there. “Playing with poor traction underfoot can not only be frustrating during the swing, but dangerous when walking down sloped terrain,” Swanson said. So before you see that it’s raining and call the course to cancel your tee time, remember that if you have invested in the right outerwear and accessories, golfing in non-ideal conditions can still be a good time. In fact, rain gives you a few advantages against the course if you understand how the fact that it’s wet out affects your game.